Starting at Headford Co-operative Mart. If you wish to enter, contact: Andrew Reddington (0876458115) Mick Finnerty (0872996956) Liam Mcdonagh (0872791439). . 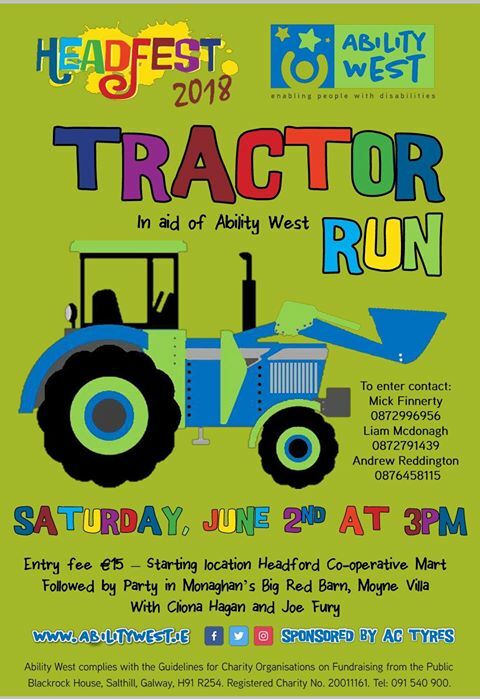 Entry Fee is €15 for the Tractor Run, with all proceeds going to Ability West for their new centre in Headford, and if you want a party that night, we have Cliona Hagan and Joe Fury in Monaghans Big Red Barn Moyne Villa.